Like many paper-writing academic types, I typically employ a haphazard and ill-planned technique for reference-handling when writing papers. I have EndNote and BibTeX, and I have used them both at times, but I really have never been entirely satisfied. I have liked EndNote at times, but the truth is the version I have is old and clunky, and I am not all that thrilled about plunging another $100 some-odd dollars into an updated version. BibTeX was great while I was using LaTeX, but most earth science journals do not accept LaTeX file submissions, and none of my collaborators are ever comfortable with LaTeX, which means I have to constantly import and export from Microsoft Word to LaTeX and back. A pain. Plus, BibTeX is great for most things, but putting out a .rtf formatted bibliography is not one of them. So to summarize, I want something cheap (read: free) that works well with Microsoft Word (the standard for my collaborators). Enter Loose Baggy Monster, my better half. One of her favorite things in the world is playing with new word processing related software. Seriously, I'm not joking. She is especially excited about reference management utilities and other things that let her release her humanities dorkosity. She pointed me toward Zotero, a free reference and bibliography management utility that works through FireFox, and integrates beautifully with Word 2004. I've now become a convert, and decided it is time to spread the word. Now, there are many features in Zotero I don't yet use or understand, and I am sure in the future I'll do a better job showing off it's power, but here are some screen shots describing why I like Zotero. Oh, and if you want, click on the pictures to see higher resolution versions. First off, Zotero makes importing references into your database very easy. I do all of my reference searching on web-based applications, such as my current GeoRef interface (shown below). You will notice that in the browser address bar, there is a little orange folder. That means that this page has enbedded bibliographic information that Zotero can read, and import directly into your database. This is a GeoRef search for the term "jimboite." If you click the orange folder, a window appears with all of references that appear on the page. You select which ones you want in your database, and once you click OK that are imported. You can see that there is another window on the bottom right showing the references that are currently being imported. 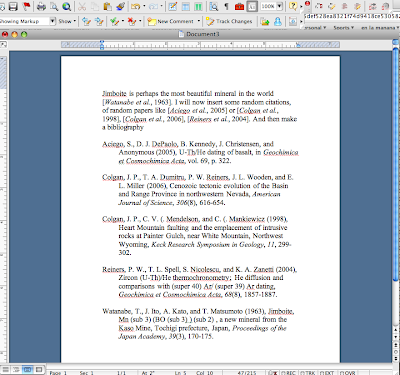 You will also notice that on the bottom of my browser window, there is the little "Zotero" icon. If you click this, you are taken to your personal database. You can see that one of the articles I had searched for and selected in my "jimboite" search is now in my database. I should mention here that this database is held on your hard drive, so even though it runs through a web browser, you don't have to be online to access your downloaded or otherwise entered database. Nor must you be on the interwebs to use the "cite while you write" functionality in Word 2004. So now lets go to Word and start writing that landmark paper. You can see that because I installed the free Zotero plugin for Word, I have a little Zotero menu bar up on the top of the screen shot. 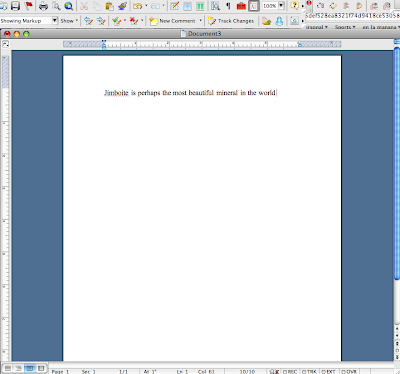 So I've written my first stunning introductory sentence, and now want to insert a reference. I click one of the menu bar buttons. And this window comes up. 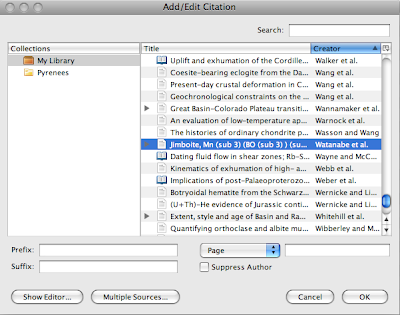 I can select what citation style I want to use. Truth is there aren't as of yet that many earth science citation styles available, but someone did make the AGU general style, which I tend to like. On the Zotero web site you can download and install the AGU style (it does not come standard), and there is also a style-maker that I have yet to figure out. 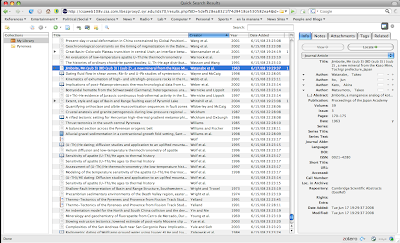 After I click AGU, I am then shown a window where I select the reference that I want to include. You can chose one or multiple, either way it is pretty simple. Click "OK" and voila! 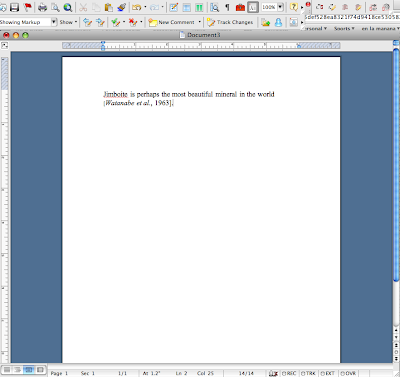 the paranthetical citation is entered into the word file. So now I'll add some more text and reference, and then click the menu bar button that says "Zotero Insert Bibliography" and Ka-Bam! Instant formatted bibliography. Now GeoRef isn't the only web search engine that lets you download references straight away. Most of the individual publisher or journal web pages do as well. There are plenty of other features I like, for example you can take snapshots of web pages if you wish to record and later reference those; you can link references in your database directly to the .pdf's on your hard drive, and so on. There are some things I want Zotero to improve on. First I'd like more citation styles. Zotero also does not have any decent way to sort out duplicate references, which is a headache. But, Zotero is one of those programs it seems is improving quickly. And hell, it's free! So as of now I am a convert. Nice ... I started using Zotero, but then never really got it going ... looks like you've had success with it. One question: I already have 100s of PDF reprints ... can Zotero be used to organize those? Can it automatically retrieve any citation information from those? Too bad your collaborators and the Geo-journals won't deal with LaTeX. I once asked the American Physical Society folks what the Word/TeX breakdown was, and at least a few years ago, 83% of submissions to the Physical Review were some flavor of TeX, 12% were Word, and 4% were not electronically submitted. I've been wondering about the best way to keep refs myself. Offline access is a must, and I would like to have abstracts and my own notes as part of the records. Abstracts I can get if I use INSPEC or Web of Science for searches, or I can (annoyingly) cut-and-paste from journal homepages, which don't seem to want to include the abstract in their downloadable citations. Does zotero work with LaTeX? Brian - Unfortunately Zotero can't auto-index pdfs, at least as far as I know. I have the same problem, enormous libraries of downloaded articles that aren't referenced. I'll update if I can find something out. I did get Zotero working well, albeit I am on a mac, and I have no idea if it plugs in as smoothly in PCland. thm - I think there need to be some updates to the LaTeX interface before it becomes that useful for my style of writing. I typically have to incorporate edits from a few different authors, who usually aren't at the same place as me. So Words "track changes" and "insert comments" features are highly useful. LaTeX, at least the interface I use, has nothing comparable. I am not all that surprised that usership is higher in Physics, many earth scientists might be slow to adapt. I definitely think it is the way to go for a thesis, there is no comparison, but for papers you want top submit to a journal, it just isn't the most useful format right now. Zotero will output (and import) references in the BibTeX style, however I don't know how well it integrates with any of the LaTeX front-ends. I'll have to look into it. Fortunately the number of equations I have to typeset is low, so Word seems adequate, although I do miss the finalized product from LaTeX. 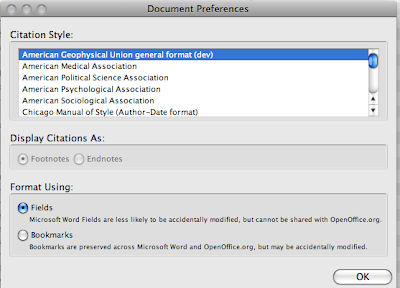 The program "Papers" will auto index pdfs and output endnote files (as well as other formats). It is awesome, but only for mac users. How do you get the word plug in to work? Is it a separate DL, and if so, from where? 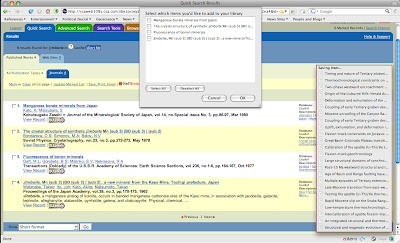 Thanks for putting us onto Zotero I have been using RefWorks (www.refworks.com) and may convert. 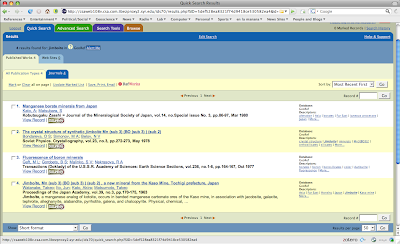 As for GeoRef, it does provide instant access to journal articles but I find it has a poor search engine, I use Google Scholar (scholar.google.ca) and Scirus (www.scirus.com), then return to GeoRef for the pdf. "...none of my collaborators are ever comfortable with LaTeX"
My mind skipped straight-over LaTeX (leitek) to Latex and I laughed a great deal about the affect latex would have on your context... it’s the simple things in life. Thanks for the recomendation about the zotero plugin, and for the manual for the insert references in a paper. Now I work with zotera, is wonderful and easy to work. I have a blog, but in spanish, and I'll make a link to your post.